Not all Ethernet cable types are created equally. They are grouped into sequentially numbered categories (“cat”) based on different specifications. Generally, there are Cat 5e, Cat 6, Cat 6a, Cat 7 Ethernet cables, etc. What are the differences between these different kinds of Ethernet patch cables? And how to choose Ethernet cable for your network? This article will provide some information about what should be considered when buying Ethernet cables. Before figuring out the question that how to choose Ethernet cable, we should first know the characteristics of different Ethernet cable types. Cat 5 patch cables are now one of the oldest Ethernet cable types, which are designed to support the theoretical speed of between 10 Mbps and 100 Mbps. However, gigabit speeds can still be attained with Cat 5 cable particularly if the cable is shorter, but is not always a guarantee. It supports a bandwidth of up to 100 MHz. The “e” in Cat 5e stands for “enhanced” and as the name suggests, it is basically an improvement on Cat 5 cables. In theory, it should be ten times faster than the Cat 5 cables without a substantial price increase. It supports up to 1000 Mbps or gigabit speeds. The Cat 5e cables have lower crosstalk and provide a faster, reliable and steady speed than Cat 5 cable. Cat6 cables and Cat6a cables are the most commonly Ethernet cable types. They have more stringent specifications than Cat 5e cables and are capable of supporting 10 Gbps. They have slighter thicker wires, and the cores are more tightly twisted together. This means the cables are thicker and less flexible than Cat 5e cables. The Cat 6 cables are recommended for large organizations which deal with pretty bulk files. For home purposes, Cat 5 and Cat 5e are positively enough. Cat 6a cables have improved properties and can operate at 500 MHz and can support 10 Gbps to a maximum distance of 328 feet. It should be noted that cable termination requirements for Cat 6 and Cat 6a cables are stringent, and the cables require better protection than Cat 5e cables. Cat 7 cables feature even more strict specifications for crosstalk and system noise than Cat 6. And shielding has been added for individual wire pairs on the Cat 7 cables. They have been designed for Gigabit Ethernet over 100 m of copper cabling, and they are rated for transmission frequencies of up to 600 MHz. Cat 7a cables operate at frequencies up to 1000 Mhz. They are designed for multiple applications in a single cable including 40G, 100G and CATV. The transmission distance can be up to 50 m for 40G, and 15 m for 100G. How to Choose Ethernet Cable? As for the question of how to choose Ethernet cable, here list two factors that should be considered. They are STP/UTP cables and solid/stranded cables. STP (shielded twisted pair) cables simply have additional shielding material that is used to cancel any external interference that may be introduced at any point in the path of the cable. UTP (unshielded twisted pair) cables have no protection against such interference and its performance is often degraded in its presence. But both of them have interference canceling capacities. Typically, using STP cables ensures that you can get the maximum bandwidth from your cabling even if the external condition is less than ideal. STP cables work by attracting interference to the shield, then running it off into a grounded cable. If the cable is improperly grounded, then its noise-canceling capabilities are severely compromised. Additionally, STP cables have a bigger diameter than UTP cables, and they are more expensive. Besides, they are more fragile as the shield must be kept intact to ensure them work properly. STP cables are commonly used in industrial settings with high amounts of electromagnetic interference, such as a factory with large electronic equipment, where they can be properly installed and maintained. They can also be used in outdoor environments where the cables are exposed to the elements and man-made structures and equipment that may introduce additional interference. UTP cables are smaller than STP cables, which makes them easier to install, particularly in bulk or in narrow spaces. They do not require the presence of a grounding cable and do not require much maintenance, but transmit data as fast as STP cables. Generally, UTP cables are more prone to noise than properly installed and maintained STP cables. They are more prevalent and popular used in domestic and office Ethernet connections, and in an area where there is not a high degree of electromagnetic interference. Both solid and stranded Ethernet cables refer to the actual copper conductor in the pairs. The solid cable uses one solid wire per conductor, so in a standard Cat 5e or Cat 6 four pair (8 conductor) roll, there would be a total of 8 solid wires. Stranded cable uses multiple wires wrapped around each other in each conductor, so in a 4 pair (8 conductor) 7 strand roll (typical configuration), there would be a total of 56 wires. Solid cables are most useful for structured wiring within a building. They can be easily punched down onto wall jacks and patch panels as they have only one conductor. The wire seats properly into insulation displacement connector. Solid cables are less useful when you are terminating with standard RJ45 connectors, as used when making patch cables. Most RJ45 connectors use 2 prongs which penetrate the conductor itself. 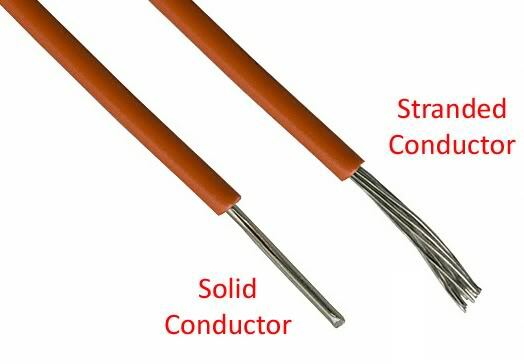 This is not desirable, since solid cable has the tendency to break when penetrated by the prong. Using a 3 prong style RJ45 connectors creates a much better connection as it doesn’t break the conductor—the 3 prongs style connection wraps around the conductor instead of penetrating it. It is recommended that stranded network cable be used for patch cables as they make better quality RJ45 termination connections than even using 3 prong connectors. Stranded cables are much less useful for punching down on wall jacks because the strands do not keep their perfectly round shape when thrust into an insulation displacement connector. For best results, use solid for wall jacks and stranded for crimp connectors. Stranded cable is typically used to create patch cables. The cable itself is more flexible and rolls up well. The RJ45 terminators have a better, and more flexible and complete connection to stranded wires than solid wire. As described above, we know how to choose Ethernet cable. Be sure to make clear the Ethernet cable types and take each of the factors above into account before finally selecting the one for your home or business project. Hope the information in this article could be helpful or a guide for you when you are confused about which Ethernet cable to buy. Cat6 vs Cat7 vs Cat8 Cable: What’s the Difference? Copper Network, Ethernet Network Ethernet cable, Ethernet Cable Types, solid cable, stranded cable. permalink. How to Get Proper Cable Management in Data Center?